New Year’s has now passed and you’ve likely made your resolution (and it’s probably something health-related, like most of us). Maybe it’s going well so far, but if you didn’t start on your path to achieving your New Year’s resolution through smaller steps, it’s likely you’ll find it difficult to achieve your ultimate goal. However, through experience achieving my own goals (and experience with a failure or two in the past), I can help you attain what you’re aiming for, with my three simple tips for achieving your healthy New Year’s resolution. Every year, I remember the goals I have made for my life, and I am proud of my changes and progress that have gotten my health to where it is today. In three years, I have totally cut out processed foods, I have taken up yoga as part of my overall lifestyle, and I am using my knowledge from my holistic nutrition training to work on my health goals. But New Year’s resolutions are not easy for everyone. 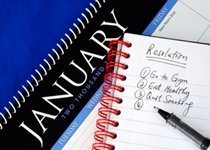 In fact, 45% of Americans make a New Year’s resolution, and only eight percent achieve their goal. Many New Year’s resolutions pertain to your health and wellness and commonly include dropping some excess weight, quitting smoking, or reducing stress and alcohol consumption. Why do so many people often fall short of these goals? People will often pick multiple New Year’s resolutions, and they will not achieve one. Or they’ll make a lofty target that’s too general to begin with. The first step towards success is to choose one specific resolution. After all, your healthy resolution is not solely based on willpower—you are changing old behaviors into completely new thought patterns. Also Read : Lose Weight By Eating a Late-Night Snack? This process takes time and patience, but there are specific steps you can take to achieve your target. Here are just three of my tips to help you achieve your New Year’s resolution once and for all! When the majority of your diet still contains processed food, your New Year’s resolutions to eat healthier and perhaps shed some pounds are that much more difficult to achieve. Some commercial diet plans will contain frozen dinners with minimal calories; it may be easy to follow these plans, but they’re simply not a healthy diet. Whole wheat breads, yogurt with fruits, and gluten-free crackers and cookies are common processed foods that someone on a diet may eat; however, these foods still contain excess sugar and artificial ingredients, which contribute to weight, stress, and depression. To achieve your healthy eating goals in a positive way, simply replace your processed foods with a whole food approach. What this means is just to avoid packaged foods. Go with mostly vegetables, fruits, nuts, seeds, and organic meats and eggs. You are also less likely to have cravings when you eat foods with lentils and non-gluten whole grains, such as quinoa, buckwheat, and wild rice. Alcohol can contain an excess of calories and sugar. Drinking alcohol can also interfere with the absorption of B-vitamins, which can lead to fatigue and depression. When you are depressed, you are less likely to achieve your New Year’s resolution of cutting down on or eliminating your alcohol consumption. Smokers also have a deficiency in B-complex vitamins, including vitamin B5, which leads to fatigue, depression, stress, and adrenal and thyroid issues. Your goal to cut out cigarettes or booze will seem nearly impossible to achieve as a result of this vitamin deficiency. By supplementing right based on the habit you’re attempting to kick, you are much more likely to achieve your goal. For example, one cigarette is known to deplete 100 milligrams of vitamin C in the body, which affects immunity. Smokers can benefit from 8,000 mg daily of vitamin C. Drinkers and smokers should also take B-complex supplements to support adrenals and mental health, which could give you greater energy and clarity to achieve your New Year’s resolutions. In the end, you may have a hidden health issue that is keeping you from meeting your goal. For example, being overweight is often a symptom of food sensitivities or intolerances. People also generally crave foods that create sensitivities, such as dairy and wheat products. If you’re looking to address any other health problem, such as unexplained stomach issues or constant migraines, you’ll also need to do a little investigating. I suggest seeking advice from a holistic nutritionist who specializes in food sensitivities and allergies. They can help you understand what foods are leading to health problems, allowing you to choose foods that contribute to your goals, rather than take away from them. Holistic nutritionists can also educate you about personal health details, and the other products and chemicals you are putting in your body from processed foods, skincare products, alcohol, cigarettes, caffeine, or other negative stimulants. Your body type, blood type, and Ayurvedic constitution are other factors that can determine what foods are best for your health, which can make achieving your goals much easier. A holistic nutritionist can help you investigate all of these angles. One bonus tip I’ll offer you is that when it comes to achieving your health-oriented New Year’s resolution, it’s important that you take time for yourself. Sometimes you may focus too much on the goal that you forget about the person you are doing it for in the first place: you! I suggest taking time to reflect on your New Year’s resolutions without any distractions—electronic or otherwise. Unplug and go for a walk in nature, take a yoga class by yourself, or block out 30 minutes of your day to read a good book. If you feel good, you’re much more likely to see your resolution to the end. Lipski, E., Digestive Wellness: Strengthen the Immune System and Prevent Disease Through Healthy Digestion (New York: McGraw Hill, 2012), 155–157. Murray, M., et al., The Encyclopedia of Natural Medicine (New York: Atria Paperback, 2012), 233–237. “New Year’s Resolution Statistics,” Statistic Brain web site, January 1, 2014; http://www.statisticbrain.com/new-years-resolution-statistics/.